1 1/2 months to make the yo yos while I was watching TV. Then I pinned them to a straw wreath, leaving plastic on wreath so I didn't have to sweep up straw chaff from the bedroom floor. 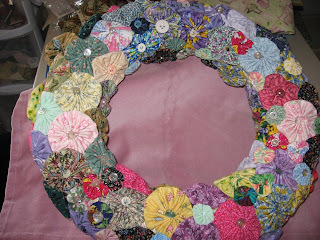 I used pins with a large head and put buttons on the pin for flower centers. The dusty pink background is a piece leftover from hemming my bedroom curtains. Our APHNYS Historians Regional Meeting was a fun and informative one yesterday at the Owego Town Hall. The morning speaker was C. R. Jones speaking on gravestones and gravestone conservation. His talk was of special interest to me as the Town of Barker took over Rogers Cemetery at Chenango Forks last year. We have a need to repair and conserve the old stones there. There are several zinc or white bronze stones in that cemetery. This little cemetery has close to 200 burials and room for 200 more. The cemetery is the burial place for many early settlers to Chenango Forks, including Simeon Rogers and his wife Mary Barker, the daughter of John Barker, for whom the town was named. Our afternoon speaker was David Cleutz, speaking on the 137th Regiment's battles during the Civil War. My great grandfather John W. Young was a member of the 137th. He was injured 'before Gettysburg' and discharged. He was shot through the back of the ankle, severing probably tendons so Uncle Harry told me. He said his foot flopped when he walked. I have pictures of John showing him to be a portly man with white hair, a white beard and that broad 'Young forehead.' My Dad, the youngest of his family, remembered his grandfather when he was very small. Did I ever tell you that at the Local History and Genealogy Center at the Broome County Public Library where I volunteer, that the cash register receipts read "We See Dead People." Our County Historian Gerald Smith has a wierd sense of humor. Broome County Public Library. Local History and Genealogy Center is the site in case you'd like to see what is available there. Be sure to look at St. George's page.